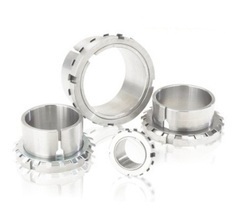 We are counted amongst the leading names in the industry, offering a comprehensive range of Bearing Adapter Sleeves. These products are known for their corrosion resistance and hassle free performance. It is based on latest manufacturing technique and is highly efficient and is quality assured. Our entire product range is environment friendly in nature and is delivered in well-defined time.